Blagny is a hamlet in the hills between Puligny-Montrachet and Meursault in the Cote d’Or, Burgundy. Monks planted vines here in the 14th century and this area benefits from a slightly above average temperature, exposure and soil than the rest of Burgundy. Vigneron, Laurent Martelet, crafts outstanding wines from this land. Laurent bottles the wines under the Comtesse Bernard de Chérisey label named in honour of his wife Hélène’s mother, who inherited their vines and passed them on to Hélène, who works side by side with Laurent. 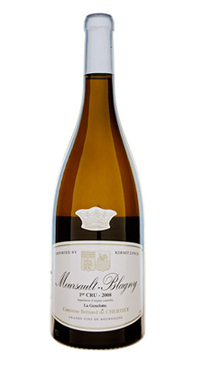 Anyone who says they do not like Chardonnay has never tasted Meursault. Domaine Cherisey has captured the essence of the terroir with this wine. The old vines (planted in the 1940’s) grow on clay and limestone soil. It is a layered and complex wine with exceptional balance of fruit and structure.